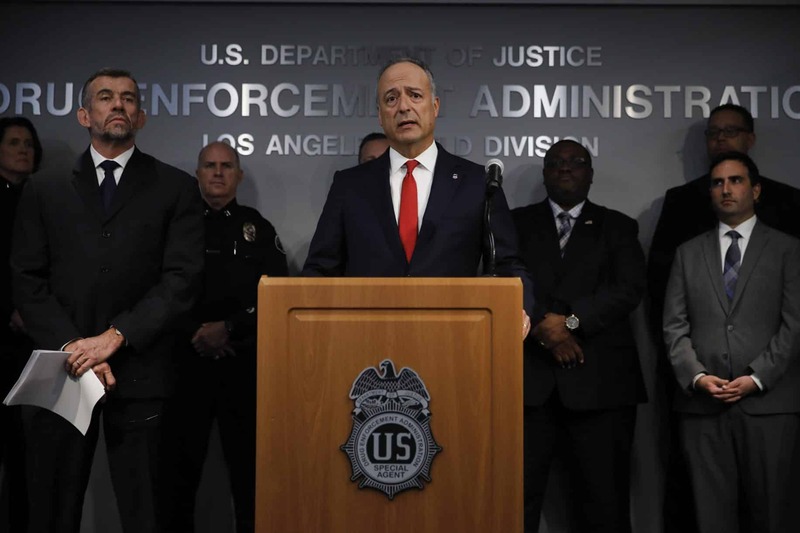 U.S. Attorney Nick Hanna, center, speaks during a news conference about an opioid crackdown in the Los Angeles area that led to the arrest of doctors and other medical professionals, including one person whose patient died of an overdose. AP photo by Jae C. Hong. Six people, including a Long Beach physician assistant linked to a deadly overdose, were recently arrested in the Southland on federal charges of diverting dangerous narcotics—primarily highly addictive opioids—to the black market. The arrests were part of Operation Hypocritical Oath, a yearlong U.S. Drug Enforcement Administration-led probe targeting doctors, physician assistants, nurse practitioners and clinic operators suspected of illegally providing controlled substances to so-called patients and black market customers in violation of their oaths to “do no harm,” federal authorities said. In cases filed over the past week, prosecutors charged the medical professionals with illegally writing prescriptions, sometimes with the knowledge that their so-called patients were addicts. In other cases, corrupt practitioners took advantage of their insider status to obtain illicit narcotics. Over a two-year period that ended in November, Hernandez prescribed nearly 6,000 controlled substances—more than half of which were for maximum-strength oxycodone, which means he was responsible for 446,000 oxycodone pills being dispensed, according to court documents. Hernandez allegedly often wrote prescriptions for drug cocktails known as the holy trinity—a narcotic, a tranquilizer and/or a muscle relaxant—which are sought out by drug addicts and are particularly dangerous because of the threat of fatal overdose, according to the affidavit in support of the complaint. In 2017, according to records maintained by the state of California, Hernandez wrote a prescription for the three drugs to a 41-year-old man who died a week later from the combined effects of alcohol and two of the prescribed drugs, according to the criminal complaint. A San Diego pharmacist contacted investigators late last year about suspicious and identical prescriptions Hernandez wrote to three people who appeared to be living in the same house over a hundred miles away from the Vortex clinic. “The vast majority of those in the medical field are good, honest people—but the MD after your name does not immunize you from prosecution,” U.S. Attorney Nick Hanna said at a news conference Thursday in downtown Los Angeles. Between April 2015 and April 2017, Berlin allegedly forged at least 44 prescriptions for controlled substances that another person filled at pharmacies in Beverly Hills and Rancho Santa Fe. In exchange for the drugs, Berlin’s buyer allegedly treated her to lavish dinners and bought her gifts. According to the complaint, Berlin sent text messages to her buyer using coded language by describing the drugs as candies and Tic Tacs. Dr. Michael Anthony Simental of Corona, 47, who practiced at the Kaiser Permanente facility in Riverside. He faces federal charges of illegally distributing hydrocodone, an opioid found in drugs such as Vicodin. Prosecutors said the investigation into Simental began after one of his patients died of a drug overdose last June. Dr. Reza Ray Ehsan of Bel-Air, 60, who faces charges of unlawfully selling controlled drugs to an agent posing as a patient during undercover meetings in December and January. According to an affidavit, Ehsan bought wholesale quantities of painkillers, allegedly selling more than 700,000 pills in 2015 and 2016 out of his office, and did not report the sales. Saloumeh Rahbarvafaei of Northridge, 40, a nurse practitioner employed at several locations, including the Good Neighbor Clinic in Leimert Park. According to the criminal complaint, undercover agents allegedly purchased prescriptions from Rahbarvafaei during five separate transactions last year. Ana Leblanc of Chino Hills, 33, who worked at a Santa Ana clinic for two weeks last year. She is charged with fraudulently obtaining prescription drugs. According to a criminal complaint, Leblanc, who has no authority to handle or prescribe controlled substances, used a prescription pad from her employer to write prescriptions for controlled substances, including oxycodone, to herself and others. Kaiser Permanente issued a statement saying Simental has been on leave since November, and his patients are being treated by other physicians. The company said it is cooperating with the investigation. As a result of Operation Hypocritical Oath, 41 licensed doctors are no longer able to practice, nine practitioners have been arrested and charged and more than $3 million has been seized, said William Bodner, deputy special agent in charge of the DEA’s Los Angeles office. He added that 15 deaths have been related to targets of the investigation. “We are in the midst of an opioid crisis that has caused untold anguish and death. Some in the medical community are stoking the fires, flooding our communities with prescription opioids,” Hanna, the U.S. Attorney, said.